As the Syria crisis enter its fifth year, millions of Syrians are either displaced within the country or live as refugees around the region. Children and young people are among the most affected with the conflict. Turkey is a host to some of the Syrian refugees. Although most of them are living among the host community, hundreds of thousands are scattered in over 22 camps. UNICEF is working with partners to engage young people living in the camps as agents of change within their communities. Some 55 of them chose to volunteer at UNICEF supported Child Friendly Spaces(CFS). At Akcakale, Turkey’s second largest refugee camp, 28,000 Syrian refugees live here. One of them is 19 year-old Razan, from Aleppo. 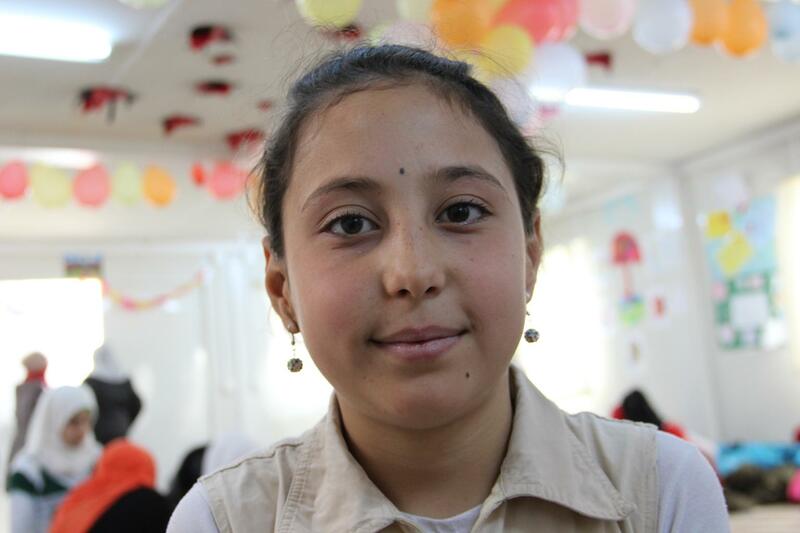 She fled to Turkey with her family two and half years ago and now lives in one of Akcakale’s tents.”I have been working as a youth volunteer at UNICEF’s Child Friendly Space in Akcakale Camp since July, 2013”, She proudly says. “It has been four years that I did not have a chance to sleep in a private room. I really miss my little room”, she adds. Razan, 18, now lives in Akcakale Camp, Turkey. Razan works at the CFS everyday, from 9 am to 5 pm. She enjoys the responsibility given to her. “I am taking care of children here to make them happy. Their families trust us and allow their children to attend the CFS activities”, She says. “I am very much pleased to work with and for children”, she adds. Abir, in UNICEF’s Child Friendly Space in Akcakale Camp, Turkey. Abir is also from Aleppo. While she volunteers here to support younger children, she misses playing herself. “I did not have any chance to play with my toys for 4 years. I miss them a lot, especially my kitchen set”, she says. From Akcakale, it is a five-hour drive west to reach Sarıçam camp in Adana. At the UNICEF Child Friendly Space here too, adolescents are helping out as volunteers. “The aim of our project is for children aged 14-18 to be volunteers, helping the younger ones”, explains Youth worker Çiğdem Yüzgeç. “We are trying to help them deal with their traumatic experiences. We draw and sing with the children in here”, he adds. The efforts of these youth volunteers are clearly bearing results. Halima, 16, fled from Hama with her family. She spends time at the CFS with two of her sisters and her three brothers. “The Child Friendly Space is my favourite place in the camp”, she says. “Before coming to the Child Friendly Space, I felt like I was in prison. I stayed in our tent all the time but now there is a place where I can play. I feel like the youth workers at the CFS are a part of my family”, she adds. 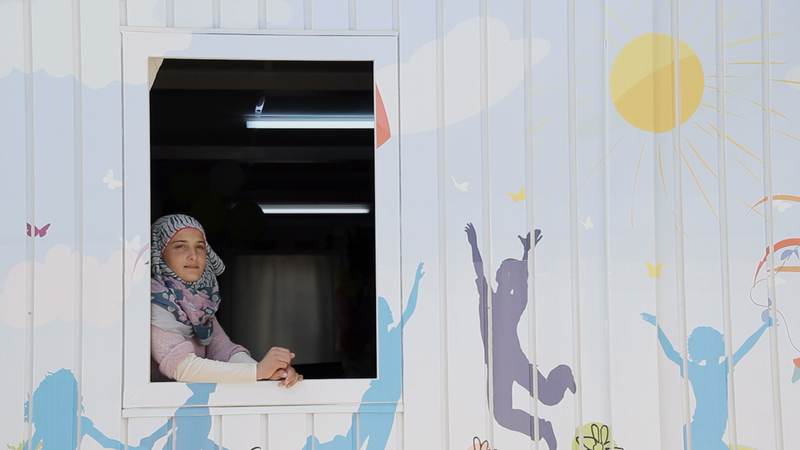 Halima, 16, in Sarıçam camp’s Child Friendly Space. 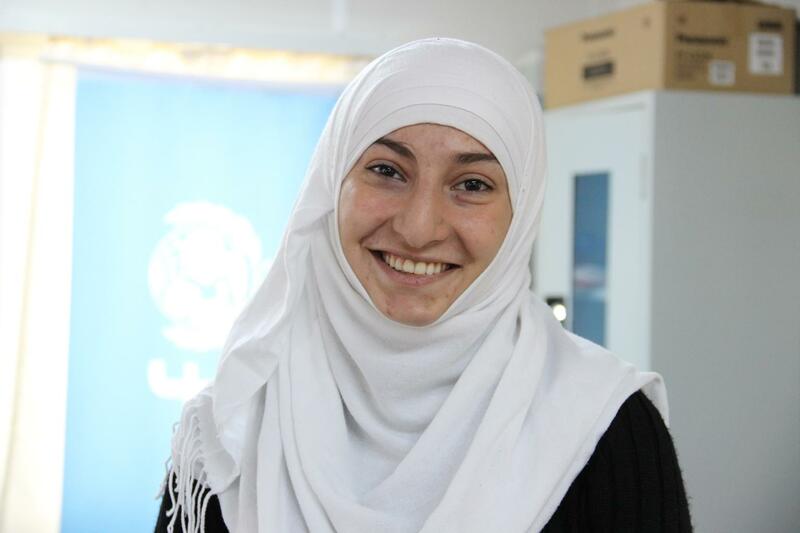 “We met Halima first in a vocational course. She was very introverted and cried all the time”, remembers Çiğdem. “We saw a great improvement in her after she started coming here. We first taught her about volunteering and leadership. We gave her responsibility. Now Halima teaches the younger ones to sing. She helps them draw, and does some drama activities with them. And she tells how happy she is to teach the children”. Having witnessed the violence in Aleppo, Mohammad’s family fled to Turkey two years ago. He was 16 then. His school was torn down while he was still in Syria. After that bitter incident, he decided to give up on his dream to become a teacher. His family heard about how their home was destroyed only after they came to Turkey. 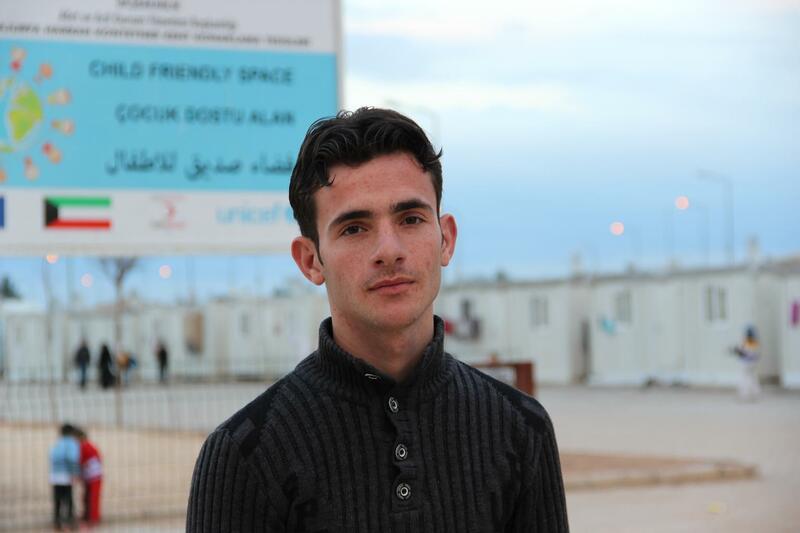 Mohammed, 18, from Aleppo, now lives in Harran Camp in Sanliurfa, Turkey. Young Mohammed started a new chapter in Harran Camp when he started volunteering in the Child Friendly Space. “We have learned a lot in UNICEF’s Child Friendly Space. When we first came here, I was more like a small child. Now I have the frame of mind of an adult” says Mohammed.